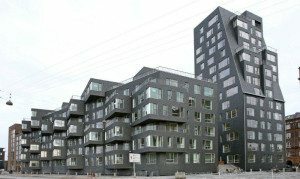 Nothing affects the appearance of a structure more dramatically than the exterior wall cladding. 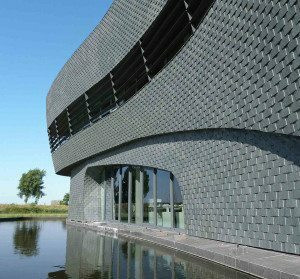 Slate siding can last centuries and never has to be painted or sealed, will resist acid rain, endure extreme heat and cold and will never catch on fire. Slate has been used for over a thousand years as roofing and siding with obvious great results. 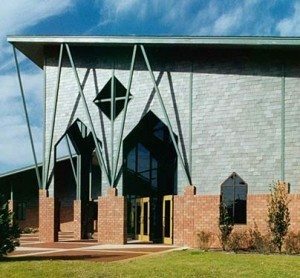 Slate siding is the SOLID choice for a beautiful and lasting finish on any structure and the cost is competitive with many of the most popular products on the market with a material cost between $3.00 and $5.00 per square foot depending on color, size and thickness. A new trend is emerging in commercial and residential construction. 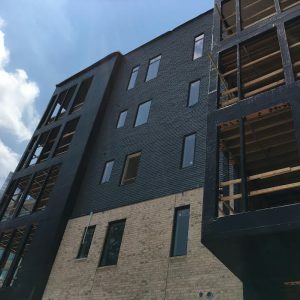 As architects and designers continue to migrate toward natural and ecofriendly products, real natural slate has recently hit the options list for exterior cladding. 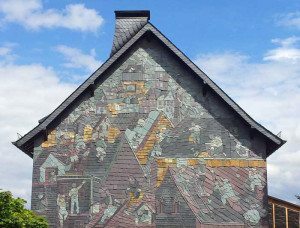 Slate shingles, a long time historic favorite for permanent roofing, are now being seen used as siding on homes and commercial structures around the country. This is not necessarily a brand new trend. A trip to just about any European country, especially Germany, Spain and the ever so design conscious France, reveals that this is a trusted and trendy option that has been used for decades in some areas and centuries in others. Natural slate is a metamorphic rock formed from ancient riverbeds millions of years ago, that is easily split into slabs and used for everything from pool tables to classrooms to roofs. 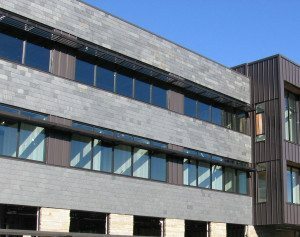 “We chose slate for cladding two buildings near each other in Chattanooga because it’s appearance, longevity, and cost. Slate is elegant, providing rich color, texture, and reflectivity: it glistens in certain types of light. It is tactile; I witness people touching it all the time. It is stone, it is enduring. It is economical for a masonry assembly, less than cut stone or brick. 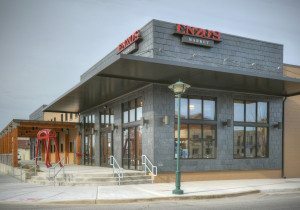 Detailing it is straightforward, resulting in an excellent building envelope.” said Craig Kronenberg of the firm Hefferlin+Kronenberg Architects, PLLC in Chattanooga, TN speaking on his designs for Enzo’s Market and Southern Surgical Medical Center. Since the installation design can vary a great deal from commercial to residential and is based on how the system is to perform, (i.e. underlayment materials and coatings, fastening systems, drainage designs) costs can vary accordingly. 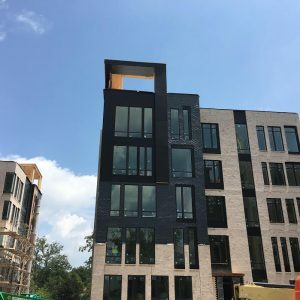 For comparison, the costs included above are basic installation labor and the cladding material only and does not include the moisture barrier or various fastening systems. On this project built in the 1980’s in coastal Georgia, cedar clapboard siding was removed, a breathable weather and air barrier was applied to the existing plywood, sealing all the nail holes, joints and window junctions, and natural slate was nailed directly to the plywood with an air powered nail gun and stainless steel ring shank nails (warranted in coastal areas with salt air and potentially high winds). Labor and materials from the raw plywood sheathing out equated to $7.75/sqft or $17,300 for the entire makeover. Cooling costs were reduced by 35% and this product will never have to be resealed or painted. In fact, with truly zero maintenance, the slate will likely far outlast the wood frame structure it is on and could eventually be reclaimed for use on another project, which is a common occurrence in the slate roofing industry. 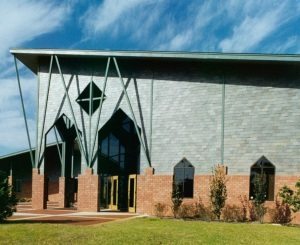 Daniel Grundhoefer AIA, Principal Architect with Quina Grundhoefer Architects in Pensacola, FL specified slate siding for the St. Sylvester Catholic Church. He says, ”We wanted a look for the building that expressed “permanence” with a material that would have low or no-maintenance. Because we had just completed a slate roofing project, we knew the cost of slate roof shakes and when we compared it to brick veneer, it actually was less expensive. So we were able to achieve a unique look with a color (green) that is typically not used on an exterior wall – at a cost that saved the church money. The installation process can vary a great deal depending on the design of the system and substrate. In Europe it is common to see exposed hook fasteners similar to those used to install roofing in the same area. There are a multitude of proven techniques, each with its own benefits, costs and potential drawbacks. So consideration does need to be taken as to how the system is expected to perform, i.e. breathable vs air tight, drainable vs sealed, etc. 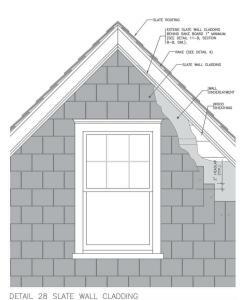 The National Slate Association has some design details available in the NSA slate roofs manual available at slateassociation.org. This manual is available in print and online. 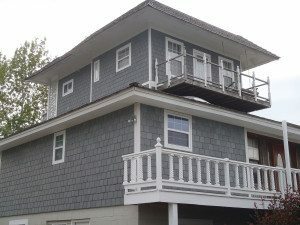 While it is mainly dedicated to roofing installations, there is a specific section on siding installation and much of the general information on available colors, sizes and design options are pertinent to both roofing and siding. It is impossible to say how quickly and to what extent this trend may develop. 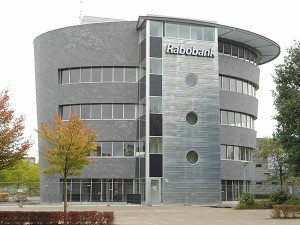 Over the past few decades, dozens of new products have entered the market, become popular then exited the cladding scene just as quickly. 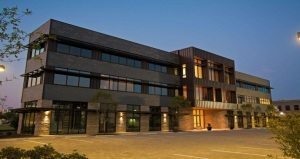 While others such as brick, stucco, cement siding, natural stone and wood has remained a mainstay in the construction industry. If European trends are any indication of things to come in “the new world”, as it seems to have been over the last several centuries, it is likely to catch on. In the meantime keep your eyes open for 200 million year old rocks hanging out on the side of old and new buildings wherever you may be. It is a look you are not likely to forget.